While the world’s only major fusion power effort — ITER — continues to trundle along, with an eventual first-fusion date of 2027 at a cost of more than $20 billion to taxpayers, there’s a small lab in New Jersey that says it can produce fusion power within a year, with a total spend of just a few million dollars. This lab uses a much cheaper and easier method to reach nuclear fusion — called Focus Fusion — with the massive added benefit that its fusion reactors are small enough and safe enough to deploy domestically. To be honest it sounds too good to be true — but rest assured that Focus Fusion, at least to my eyes, is the real deal. This isn’t some kind of magical, inexplicable witchcraft like cold fusion: Focus Fusion appears to be based on cold, hard science. This could actually be it. The key to Focus Fusion is a dense plasma focus device and a form of fusion called aneutronic fusion. 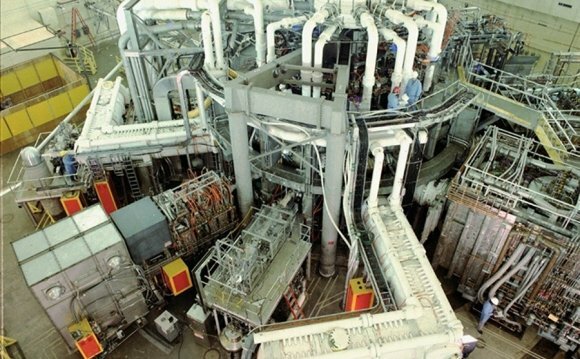 These are both completely unlike current controlled fusion systems — such as the American NIF, European JET, or international ITER — which use massive magnets or lasers to create magnetic and inertial confinement fusion. Both inertial and magnetic confinement fusion require massive, billion-dollar setups that are hard to build and tough to fund. The following video neatly explains what a dense plasma focus device is. There are two key advantages to deep plasma focus fusion (hereafter shortened to Focus Fusion). The fusion of the fuel (hydrogen and boron) creates very few neutrons (it’s aneutronic), which means almost no nuclear waste is produced — you could walk inside one a few seconds after a Focus Fusion generator has been turned off without any ill effects. The second major advantage is that Focus Fusion emits most of its energy in the form of an ion beam and X-rays, both of which can be converted very efficiently into electricity (conventional deuterium-tritium fusion power produces heat, which is then turned into electricity via huge steam turbines). Combined, these advantages allow for the creation of small (~5 megawatt) generators that can be located within a neighborhood or town. This reduces transmission losses, and reduces the risk of mass power outages following a disaster or cascading grid failure. It could also help with rolling out reliable power to countries without an established grid.